Radical addition to alkenes can be applied to the production of macromolecules. Like other polymerisation reactions involving alkenes, it involves the formation of a reactive intermediate by the action of an initiator on an alkene. A chain reaction results in which other alkenes are enchained into a polymer. The term "initiator" here is used in a slightly different way than we have used it with other radical reactions. The radical initiator has already undergone its reaction to form a radical. That radical then initiates chain growth. This step is really a propagation step in terms of types of radical elementary reactions, because one radical leads to a new radical. Polystyrene is one example of a material that is frequently prepared via radical conditions. During the reaction, a radical adds to the double bond of the alkene. The newly-formed radical, in regular alkene addition, would then react with something to abstract an atom and achieve stable, closed-shell configuration. However, in a polymerisation reaction, alkene molecules are intentionally packed closely together. Either they are very concentrated in solution or else they are neat (with no solvent at all). As a result, the newly-formed radical just gobbles up another alkene. There are lots of ways to carry out this reaction. One way would be to take some styrene, heat it up until it melts, and add some benzoyl peroxide. 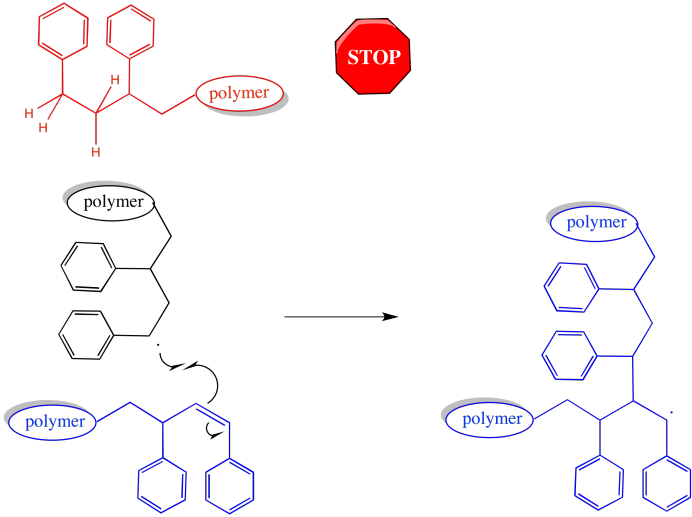 Radical polymerisation is a critical method of preparing polymers. The figure below shows a number of monomers that are commonly polymerised under radical conditions. Look at the monomers listed above. a) For each of the three groups (fast, medium and slow), identify what structural features the members of the group have in common that distinguishes them from the other groups. b) Propose a reason why the fast group undergoes more rapid polymerisation than the other groups. c) Propose a reason why the medium group undergoes more rapid polymerisation than the slow group. Provide a mechanism for the polymerisation of styrene in the presence of benzoyl peroxide, up through the first couple of propagation steps. A radical polymerisation, after the initiator gets going, is just a series of propagation steps in a row. How does it all stop? There must be a termination reaction. That can happen in a couple of different ways. For example, two growing chains might encounter each other, head-to-head. A collision could bring the unpaired electrons together to form a new bond. Two growing polymer chains would come to an end at once. At the same time, the chain length and molecular weight doubles as two chains combine into one. Of course, most of the other chains in the polymerisation continue growing normally. As a result, the distribution of molecular weights broadens dramatically. Some chains are twice as long as the others. Alternatively, when two growing chains collide, one might carry out a hydrogen atom abstraction on the other. The hydrogen abstracted might come from the head of the chain, alpha to the active radical. That C-H bond is a little bit weaker, as bonds alpha to radicals typically are. The chain that picks up the hydrogen is no longer a radical. The chain that loses a hydrogen is no longer a radical, either. Both chains stop growing. Because other chains around them continue to grow, these one lag behind, resulting in a wider distribution of chain lengths. Of course, a hydrogen atom abstraction could happen elsewhere along the chain. In that case, the chain that abstracted the hydrogen stops growing, as before. However, the chain that lost the hydrogen now has two radicals. That makes two sites of chain growth. This chain starts growing twice as fast as the others. Eventually, that's going to lead to a big difference in molecular weights. These termination events, all of which are possible and which occur more or less randomly, have profound consequences on the material produced. There is an effect on chain length and molecular weight. Chains that have abstracted a hydrogen atoms come to a complete halt. They stop growing altogether. On the other hand, chains that have had a hydrogen stolen from them may grow again. Either they have an additional radical introduced, or else they form a π bond, which can react with another radical and start growing again. When they do, it will again be a case of two chains coming together -- an active one and a macromonomer -- leading to a trmendous jump in molecular weight. 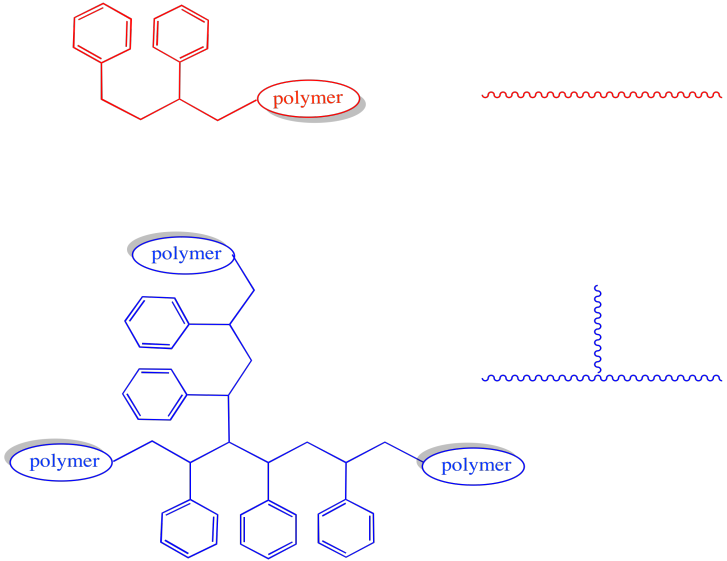 The morphology of the polymer is clearly altered by these events. Most growing chains are simply linear: they consist of a series of enchained monomers, all in one row. However, in either of the cases in which a growing chain has lost a hydrogen atom, then continued to grow, the shape will be branched. These two architectures have very different properties. For example, we would expect a very different Tg in a branched polymer than a linear one, with chains flowing more freely at lower temperatures in the linear one. Explain why this rate law occurs, based on the mechanism. There is a great deal of interest in aqueous polymerisations for environmental reasons. Hydrogen peroxide is an obvious water-soluble initiator; however, it is slow to initiate polymerisation. Show how initiation can be accelerated in the presence of Fe(II) ions. A number of compounds can be used as inhibitors of radical polymerisation. For example, benzoquinone will stop radical chains from growing. Show a mechanism for its reaction with a growing polymer chain and explain why the product of the reaction is a relatively stable radical. It may be surprising that one of the most effective inhibitors of radical polymerisation is molecular oxygen; it can slow the polymerisation rate by a factor of tens of thousands. The radical that results from the addition of O2 to a growing chain is considered to be resonance-stabilised. Show the mechanism of O2 addition and demonstrate resonance stability in the product.